Ms. Dhanya Bhaskaran has been actively engaged in the field of teacher empowerment and corporate training for the past 15 years. Ms. Bhaskaran is specialised in English Language Teaching, Language Skills Development, Business Skills Development, Soft Skills Development, Teacher Empowerment, KG Teacher empowerment and Story-Telling. She is associated with Ratnasagar P Ltd. as Sr. Marketing Editor (Kerala Region). She was associated with eminent MNCs and NGOs such as TCS (Tata Consultancy Services), APF (Azim Premji Foundation), RELO (Regional English Language Office, under American Embassy), Orient Blackswan Pvt. Ltd Ratnasagar P Ltd. and ELTIF (English Language Teachers’ Interaction Forum). She has membership in professional forums such as KMA, IABS, ELTIF and ELTAI. Ms. Bhaskaran has rendered her service to Gulbargha University (Faculty, Dept. of English), SRM Sivaji Ganesan Film Institute, and PMR Engineering College. During her career she has been engaged with learners from various walks of life including IT professionals, officials of Education Department from various South Indian states, school- college teachers, students from professional colleges, Arts and Science colleges and schools and teachers and students of pre-schools and kindergarten. She has also supported several NGOs in their empowerment programmes in various parts of the country. Ms. Bhaskaran has presented research papers on ELT, ESL Education, Rural ESL Teacher Education, General Education- Pedagogy and Methodology and Rural Teacher Empowerment in various International and National seminars and conferences. She has also published research articles in eminent international journals such Asian EFL Journal, RIE Journal and ELTAI Journal. Ms. Bhaskaran has edited series of academic course books for KG sections. She supports schools in curriculum planning, academic course designing, syllabus selection, course designing, school/ class management plan designing and execution and evaluation planning and execution. She also supports the schools in designing and implementing school development plan to meet the future developmental needs of the school. She has authored novels, novellas and poems in various leading magazines, newspapers and e- magazines. For her first novel for children, she bagged Atlas Kairali Children’s’ Literature Award. Her books have been published by State Children’s Literature Institute and KSSP. Aunt Owl’s Tales, the story tellers’ forum, is an initiative by Ms. Bhaskaran. Aunt Owl’s Tales is an engaging story telling programme, which focuses on the development of social, linguistic and emotional skills of children and adults. This programme encompasses various activities which lead to the holistic development of the participants with special focus on enhancing their thinking skills, presentation skills, synthesising skills, imagination and creativity Ms. Bhaskaran is an alumnus of Govt. Brennen College, Kerala, Stella Maris College, Chennai, St. Ann’s College of Education, Mangalore and EFL University, Hyderabad. She has M Phil in English Language and Literature and in Education. Currently she is pursuing her Ph. 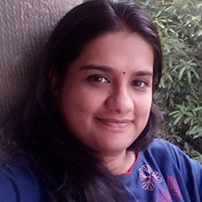 D from Anna University, Chennai and her area of research is Continuous Professional Development of Rural ESL Teachers. As an avid traveller, Ms. Bhaskaran spends most of her free time in travelling and she prefers to explore roads less travelled. Books are her best companions and stories are her passion. She is active in social media and is also into blogging. The urge to experiment in the field of education keeps her active and the determination to support the rural education sector in the country boosts her spirit.